JVC introduces latest Everio GZ-HM550 camcorder, it comes with excellent features and design. It is most portable and handy camcorder gadget. It is equipped with a 10.6 megapixel CMOS sensor, an SD / SDHC expansion slot, 32GB of inbuilt storage, an included Bluetooth module (for controlling the camera’s play record and zoom functions via cellphone). It is a Bluetooth headset and it is able to monitor the recorded sound or input voice recordings. Other features include recording, the ability to snag 9 megapixel stills and a 16x zoom. It is built in advance technology and includes voice recording system. Design of this latest camcorder is awesome and includes gray color. We have seen a lot of camcorder prior in the market but I found this latest camcorder amazing. 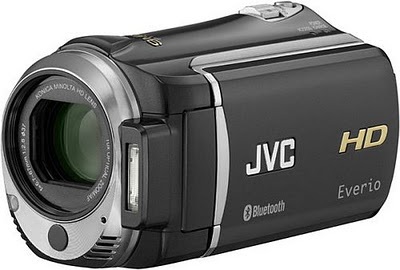 JVC is a well known company for making camcorder in market. This latest camcorder can give you the best images as well it records video. JVC Everio GZ-HM550 camcorder has great features as well it has excellent battery power.